When the Twitter hashtag for the Fall 2010 Communications Network / CommA Conference was announced a few weeks ago, I set up the ComNet010 hashtag on What the Hashtag?! While I use any number of tools during a conference to track discussion on Twitter, What the Hashtag?! provides several functions that I really appreciate. Foremost, it allows users to generate a transcript for tweets using the correct hashtags (sadly, none of the search services can pick up on hashtags that have additional characters added to them, such as the end quotation mark that now shows up when you “quote” a post on Twitter). It also provides some statistics on the extent of the Twitter conversation. The contributors number really stood out to me – I’m not sure on the official count of people attending ComNet010 but the conference discussions clearly extended beyond the physical conference space. We managed to engage people who were tracking the posts from afar. That said, we also liked to reinforce our comments – 41% retweets is a lot, no? The first day of the conference generated 775 tweets while the second day had 540 tweets. I suspect that if the conference had ended at 5PM instead of 12:30PM we would have easily eclipsed the previous day’s total. The top 10 contributors over the past seven days of ComNet010 posts are listed below. I’ve gone ahead and added their names, titles and organizations as well. Sadly for me, I only met five of them in person. I also ran a network map using tracking the ComNet010 hashtag, using Mentionmap a visualization tool for twitter from Asterisq.com. The network map helps identify some of the additional hashtags cross posted during the conference. The last thing I did is run the transcript of posts made using the ComNet010 hashtag. In this case, I extended the search back to September 7th, when the first ComNet010 tweet was posted by me, through the morning of October 2nd. The transcript is available as a Google Doc. 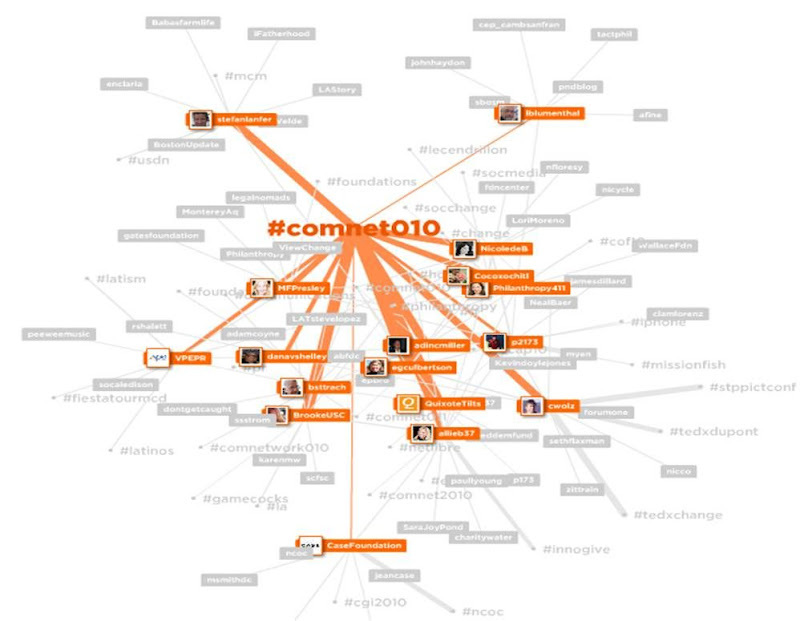 Again, some tweets that ended with ComNet010 or used the wrong hashtag (commnet010 was one) are not included. But, the transcript offers a great resource for further study (in this case I’ve converted it into a Google document, not knowing how long the webpage might exist). Please note the time stamps are set to 0 GMT even though the website states that the posts are in the Pacific Time zone. This entry was posted in Philanthropy and tagged ComNet010, Philanthropy, Social Media, Twitter. Bookmark the permalink.